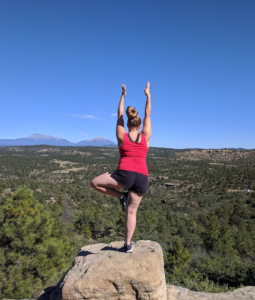 You are here: Home / physical therapy / The Sam Squared Journey and How Yoga Can Help You Too! 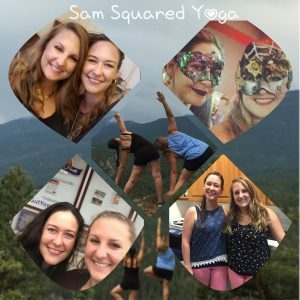 The Sam Squared Journey and How Yoga Can Help You Too! Samantha Brown and Samantha Goeke are two women who work at Physical Therapy Connections, P.C. and who just became certified yoga instructors! They want to share their journey with you to help inspire and demonstrate the importance of yoga. Before starting yoga I thought that it was just a form of exercise that hippies and vegans did. I was a little scared of the chanting and, of course, the poses. I had dabbled in yoga a little in high school after two ACL tears because it was one of the only things that I could do at the time. I was an athlete who lifted weights, ran and played sports…that’s it. The thought that yoga could bring me more than physical benefits never even crossed my mind as a country girl from Illinois. It wasn’t until the fall of 2016 that I started paying attention to yoga. I had ruptured my patella tendon in my right knee and was rapidly gaining weight and experiencing atrophy of my right leg muscles. My days of running and playing sports had long passed, so I needed to find something that fit my needs. Though the yoga that I was following was a P90X tape, it still sparked my interest. I was able to workout and not injure myself at the same time. In the fall of 2017 I had gone to a conference for work and the speaker was showing us some different yoga poses and how to teach them. This is when my love and passion for yoga really started. I was able to do most of the poses and the ones that I was unable to do made me want to practice more! I went home and started researching yoga in my area and found Fountain of Health Yoga Studio. 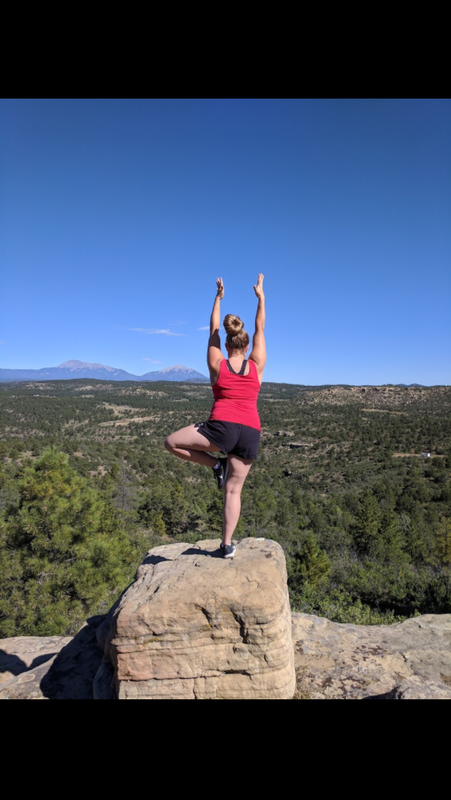 For anyone in the southern Colorado area looking for a place to go (besides at our clinic of course) to just get started in yoga, FHYS is the place to be!! Marcee and all of the instructors are patient, kind, and know what they are doing! Sam Brown and I are so blessed to have found her because she showed us everything that yoga has to offer. From meditation, to breathing techniques, to modifications and proper alignment, she taught Sam and I what yoga is all about. The reason I am teaching yoga is because I have found something in my life that gives me focus, drives and challenges me, and brings me peace and serenity. I want to share all of my knowledge with others to help them overcome any challenge presented to them. I first became interested in yoga in high school when a friend of mine brought me to her yoga class at a well known local gym. I was so excited and impressed about what we were doing because I was sweating and shaking and just when I thought, “I can’t go on, I’m going down!” we got to rest! This went on throughout the entire class and ended with us laying down and reflecting on our practice and the intention we’d set for that practice. I thought this was the absolute best form of exercise I had ever experienced! I left feeling wonderful and wanting to know more about yoga. After that day I studied as much as I could about yoga on my own. In 2013 a yogi friend of mine gave me a beginner yoga DVD and I practiced with that all the time at home before finally deciding to really get serious and focus on become a certified and registered yoga teacher myself. 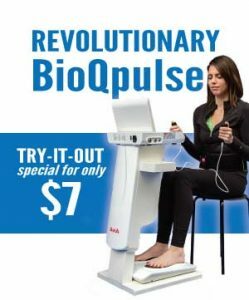 I have worked with Physical Therapy Connections and their extremely knowledgeable and talented Physical Therapists and Medical Massage Therapist for over 5 years and the three dimensional whole body approach that they take to physical therapy as opposed to traditional PT is so revolutionary! Yoga is the next step to making that experience that much better! I got into yoga to help myself and to help others. The best part of yoga for me is that it gives us space; in our body, our soul and our mind. It gives us the opportunity to find what feels good to us and explore that. No matter your age or capability, you can do yoga. Some of the poses may be more challenging than others, but we have learned how to modify those poses so that you can participate. If you are going to a level 1 class, what are some things that you should look out for or avoid? (we will be going over this). Yoga is over a 5,000 year old practice and we definitely need to give it the respect it deserves. Now I’m not saying that we are yoga Gurus and know EVERYTHING yoga, but we have taken a 10 month course with an awesome instructor who has been teaching for over 20 years. Yoga is a practice. Even when you master one thing, there is always another pose or technique to improve upon. We all have to start somewhere and that is what Sam Squared is here to do! Yoga is not about cool pictures half naked by a beach doing cool poses. Yoga is about finding out who you are, discovering your heart qualities and using poses, meditation and breathing techniques to enhance your full potential. When done properly, yoga can bring you not only peace of mind, but it can reconnect you with your true divine nature, bring clarity and heal you (not just in the physical sense). Let’s redefine what yoga is and break the stereotypes! No matter what religion you are, yoga can apply to you. We have heard some comments that religion may be a cause for concern for practicing. Yoga can deepen and reconnect you to “source” (whatever that may be for you). 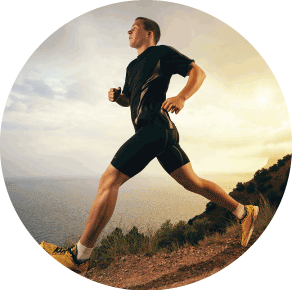 We will offer go over other health concerns and any other questions that you may have for us. RSVP for our upcoming workshop HERE or call 719-565-6678 to speak with Samantha Brown or Goeke.